Construction industry is a significant part of rapidly expanding city of Pune. And manpower is an important ingredient of this industry. Sustaining the cultured image of Pune, builders in the city have moved beyond huge projects and profit calculations, and have been actively contributing to build the future of their labour’s children. 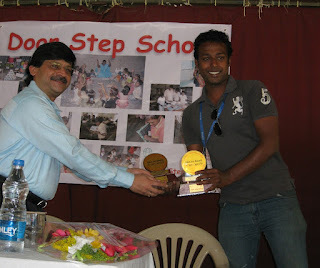 Door Step School, an NGO that runs study centres for construction workers’ children at more than 100 construction sites, felicitated supporting builders with ‘EduCare Awards’ on Saturday, 12th May 2012. The function held at ‘Nivara’ hall in Navi Peth, was chaired by Mr. Anuj Bhandari of CREDAI (Builders’ Association) Pune, Labour-Welfare Committee. Jayashree Joglekar, Director of Door Step School, presented annual report of the organisation. She thanked CREDAI and builders for supporting the NGO in educating construction workers’ children. Mr. Bhandari appreciated the work done by Door Step School. ‘Since their children’s education is taken care of by someone at the site, the labourers - usually both parents - are found to be working more efficiently. This improves quality of the product and benefits the builders as well as the customer,’ he said. Mr. Bhandari congratulated the builders for their contribution to the cause, and expected increased support from the community in future. Rajani Paranjpe, Founder-President of Door Step School, spoke about ‘Every Child Counts’ campaign, and appealed to the citizens to join hands for ensuring 100% school-enrolment of six-year-old children across Pune city. Project Director Ravindra Mahamuni presented vote of thanks. Eminent builders and their representatives, donors, volunteers, staff members, and citizens were present in large numbers. Attendees visited and appreciated the exhibition of various projects run by Door Step School.